At the TreeTop Adventure Park, near Sydney, enjoy climbing challenges in the trees and flying through the air on zip-lines. You’ll be thrilled by the challenge of making your way around the beautiful native forest on the agility courses, rope bridges and zip-lines set high in the trees. 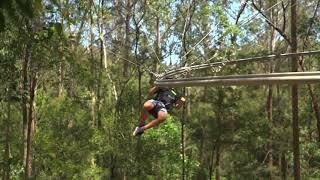 More than a hundred challenges, including 20 zip-lines or flying foxes, are in the park. Four courses are available for children as young as three and include four flying foxes. 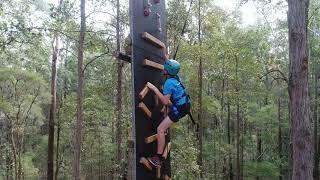 A belay safety system keeps children safely attached so they can focus on climbing, swinging, leaping and flying. The Treetop Adventure Park is in the Ourimbah State Forest on the Central Coast of NSW and is open daily, except Christmas Day. From Sydney, the drive north to the park is 80 minutes. You can travel by train from Sydney to Wyong Station and change for a six-minute taxi trip to the park.